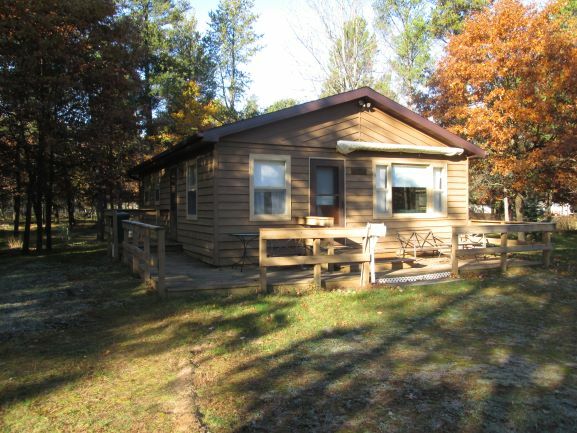 This cheery, clean, and functional cabin in Camelot has all the basics! Retro for sure, but a few cosmetic touches could go a long way! Featuring an open living room and kitchen area, three bedrooms, and spacious L-shaped deck, with an awning. Perfectly situated on a large, level lot with mature trees and well-built shed. Roof, metal soffits, and fascia done in 2014. Enjoy ease of boating, fishing, and water sports with your deeded access to Lake Camelot. Championship Golf, Mini-golf, ATV trails, and more, all within minutes! Lawn tractor and many large furniture pieces plus kitchenware to be included for convenience. Home is served by 2-bedroom Septic.